Kids and cleaning don’t exactly go hand in hand! It takes a whole lot of nagging on your part, and tons of kicking and screaming on theirs to get your kids to clean. Nevertheless, kids do have a responsibility of tidying up after themselves and helping out around the house. Of course, kids can only do age-appropriate chores. Therefore, you need to follow a couple of rules including safety tips and cleaning schedule with your kids to ensure that things are done in a safe and proper manner. Read on for our top tips on how to get your kids to clean while keeping safety guidelines in place. A weekly schedule helps get the ball rolling in an orderly manner while allowing you to distribute chores fairly and appropriately among your kids. This way you can spread out bigger cleaning jobs over the course of days so that your children don’t get too stressed out when cleaning time rolls around. 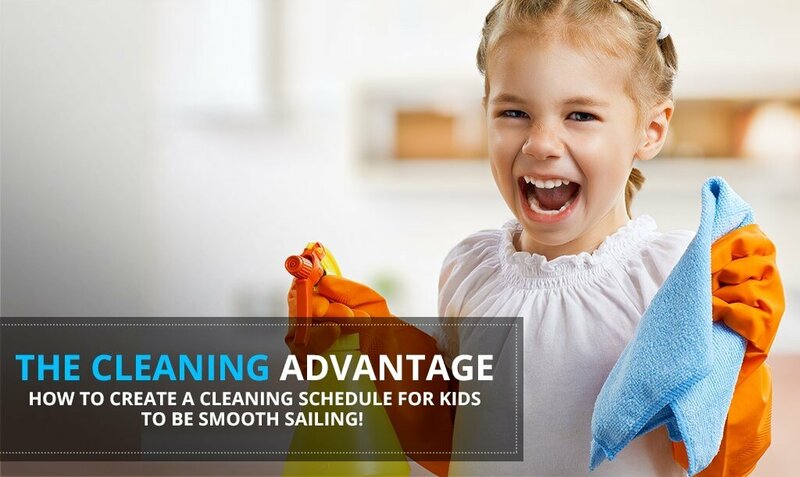 What’s more, a cleaning schedule with strict timings will help get your kids into the habit of regular cleaning. Kids find cleaning a drag because, more often than not, it is! But if you made the work environment a little chirpier and threw a game into the mix, surely your kids would be more enthusiastic about cleaning! Here’s what we suggest; first of all, put on some music to get rid of that somber mood. Next, come up with original games that will keep your kids interested; for example, have a ‘beat the clock’ game with a small reward at the end of it. Of course, you’ll have to keep strict guidelines for this as well to ensure that the cleaning is done thoroughly. For safety reasons, it’s important that you supervise your kids when they’re doing household chores where there is a potential danger. For example, a kitchen is a place where there are sharp objects, a gas/electric stove and other appliances; hence, it’s advisable to be around when your kids are tidying up in the kitchen. Similarly, where there is glassware or other fragile items, supervised cleaning is advised. Apart from this, it’s important to give your kids age-appropriate household responsibilities and help them out when needed. Don’t blame your kids for not doing a job right if you’ve given them vague instructions. Children need to be given clear and simple instructions so that there are no misunderstandings. Even if you want their room tidied up, you need to instruct them on what needs to be done for their place to be considered neat and tidy. At the end of the week, an allowance or reward is in order. It may come across as a bribe, but it sure is effective! Especially if you don’t want to nag your kids to clean on a daily basis, an allowance or weekly reward is enough to motivate them to do their chores thoroughly and on time.